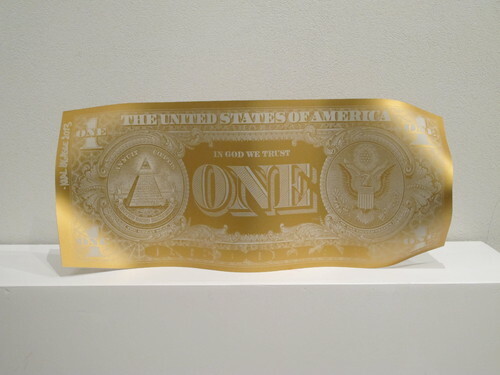 The acclaimed artist Karl Lagasse came into prominence in 2009 with his “One Dollar” sculptures. 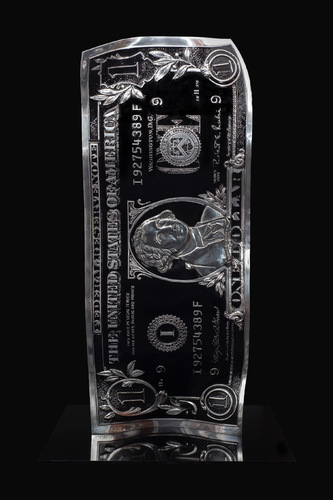 In 2009, Artprice named Karl as one of the top 10 sculptors under 30 in the world. In 2012 the New York publication Farameh selected Karl for their book FOR WHICH IT STANDS: Americana in Contemporary Art in which he is represented as one of the fifty best contemporary artists who found inspiration through traditional American icons. 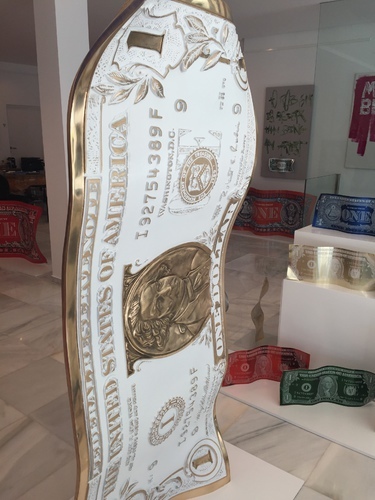 During the 2016 Art Paris Art Fair, the President of the French Republic personally congratulated Karl for the success of his 2-meter bronze “One Dollar” sculpture displayed at the Grand Palais. Karl began his artistic journey with his collages when he was 7 years old. In the same year, he met the French sculptor César Baldaccini who inspired Karl to continue developing his work. He ventured into the Paris metro where tagging and graffiti became his predominant world of creation. However, his collages remained his true passion. It was the artist Yvaral Vasarely that suggested Karl incorporate his collages with his tags, and in 2003 Karl prepared his first exposition in Paris. His first solo show presenting his “Building” sculptures was in 2006 at the Isy Brachot Gallery in Brussels. Two years later, at the Theatre Espace Pierre Cardin, Karl was back in Paris for his first solo show of paintings and sculptures with added elements of videography and photography. 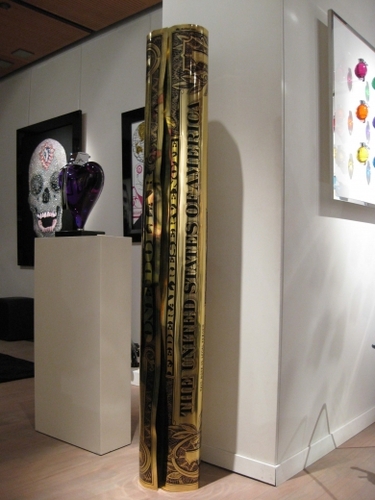 Karl enjoys premiering his new works at expositions worldwide including: 2011 Art Monaco with Gallery Bel Air Fine Art where he presented his creation “Cryptogram One”; 2012 solo show with Gallery Artco France where he presented his “one dollar” sculptures with the chosen the theme "In God We Trust"; 2016 solo show Gallery Atrium in Marbella (Spain) where the city’s mayor inaugurated the exposition and spoke to the international press regarding the work of Karl Lagasse. In 2010, Karl was chosen to represent the city of Deauville (Normandy) at the world riding championships Horsemania in Lexingston (USA) where he created a horse sculpture in honor of the events. 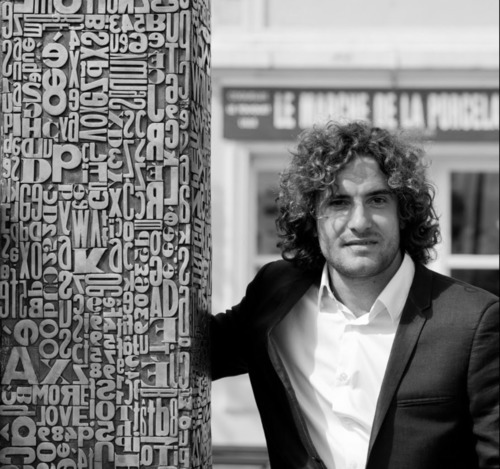 Returning to Deauville in 2012, Karl offered the city his bronze “Cryptogram One” with a message of peace and love, which has been installed at the entrance of Deauville and was inaugurated by the mayor, Philippe Augier. In 2012, Karl created a monumental sculpture for the 65th Festival of Cannes in collaboration with Corbis. Images from 1945 to 2011 were used in the work of art, which was exhibited at the Carlton Hotel where artists involved in the festival could sign their name. Signatures of the artists include: Alexandra Lamy, Gad Elmaleh, Bérénice Bejo, Marie Gilain, Michael Youn, José Garcia, Michel Hazanavicius, Nadine Labaki, Cuba Gooding Jr., Tim Roth, Matthew McConaughey, and Zac Efron. France Culture in a 2016 article, amongst other prestigious artists, such as Jeff Koons, mentions Karl Lagasse and his monumental installation called “A Piece of Heaven on Earth”. The installation shows a Maserati covered in white plastic film with a sculpture of Jesus Christ at whose feet are several dollar sculptures together representing the greatest debt of humanity paid in full. The installation was presented at the 2015 Art Paris Art Fair in collaboration with the Italian luxury vehicle manufacturer Maserati. Maserati first contacted Karl for collaboration in 2014 at the worldwide launching of their new car model Ghibli.The Ghibli model was used by Karl in creating his masterpiece Psalm 2, which celebrated Maserati’s 100th year and was revealed at the 2014 Art Paris Art Fair.